Plans for another wind farm in Wales housing the country's tallest turbines have been announced in Powys. Ten, 110m (363ft) high structures are earmarked for land at Pen Coed, near Llanfair Caereinion. 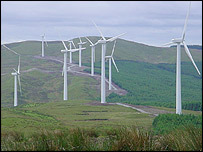 In August, similar sized turbines at Mynydd Llanllwni, above the Brechfa Forest in Carmarthenshire, were given the go-ahead. Public exhibitions will be held next week to show details of the Powys scheme. Gamesa Energy UK (GEUK), said the wind farm, which is planned to include 40 solar panels as well, could generate enough electricity for about 11,000 homes. The turbines would also be 10m higher than those at the UK's most powerful onshore wind farm at Cefn Croes, near Aberystwyth, which opened in June. The company, based in Newport in south Wales, already held a consultation earlier this month over plans for 16 turbines at a wind and energy park at Llanfynydd, near Carmarthen. This scheme has been opposed by local campaigners. Renewable energy adviser for the Campaign for the Protection of Rural Wales, Geoffrey Sinclair, said the turbines in Powys would be among the tallest in the UK. "The turbines would be the largest than any yet built in Wales and among the tallest in the UK," he said. "There are applications in for turbines of that size elsewhere." Exhibitions will be held next week at Llanerfyl village hall, near Welshpool, on 30 November, and the Cann Office hotel at nearby Llangadfan on 1 December (both 1400-2000 GMT). 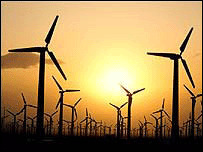 There are 20 onshore wind farms in Wales and 395 turbines. The Welsh Assembly Government expects 10% of electricity generated in Wales to come from renewable sources by 2010.